One-piece 24'' wall plate can work on most of wood stud spacing; Easy centering for wood stud spacing less than 24''. Caution: This mount is NOT for drywall alone installation! This mount withstands 4 times claimed loading weight capacity. 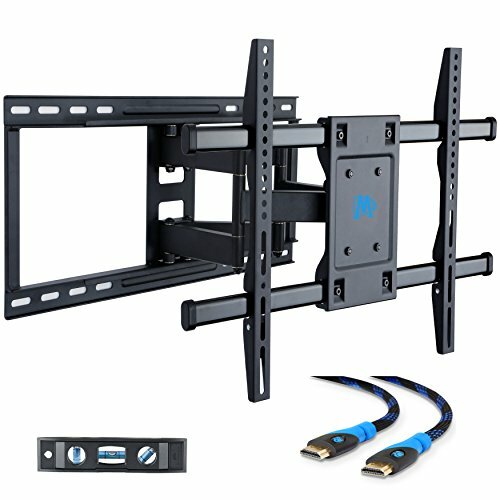 This mount fits most of 42-70" TVs sold today. It fits TVs with mounting holes as close as 4"x4" or as wide as 24"x16" (in TV terms - VESA 100x100mm to 600x400mm). Specifically, it fits for VESA 100X100, 200X100, 200X150, 200X200, 300X200, 300X300, 400X200, 400X300, 400X400, 500X300, 600X200, 600X400mm. Retracts 3.8" low profile, Extends 16" from the wall. With dual articulating arm design, this mount retracts to 3.8"(to wall) to save space, and extends up to 16" from the wall. +5°/-15° Tilt, +/-5° rotate and swivel side to side for comfortable viewing flexibility, provide smooth adjustment for all directions, make it easy to view your TV from multi-angles. This mount is equipped with tool free spring-loaded handle for easy tilting angle adjustment. It comes with torpedo level and 6' HDMI cable. HDMI cable supports 3D, Ethernet, 1440P and Audio Return conforming to latest HDMI 1.4 Standard. This mount ships with hardware for both wall and TV mounting. Anchor is not included. Concrete anchors will be sent if needed. Anchor is only for concrete wall installation NOT for dry wall installation! Heavy duty unit fits for most of 42-70" TVs up to 100 LBS, with max VESA 600 x 400mm/mounting holes spacing. Our mounts are tested with 4 times loading capacity listed. Images on left side will help you see if this mount perfectly fits your TV in the aspects: VESA, studs spacing and possible blocked input. Not perfect? You can check other Mounting Dream mounts for BEST options. One-piece long wall plate: Fits for solid concrete wall/ wood stud spacing of 16'', 18'', 24''. Easy centering (lateral adjustment) with this long wall plate, and paper template for easy installation. Caution: This mount is NOT for drywall alone installation! Viewing becomes more comfortable: tilts TV up 5° and down 15° to reduce glare, swivels TV left or right according to your seats position. Pull out to 14.6 inch and retract back to 2.4 inch, making your TV alive to move. Easy installation with decent instruction and mounting template, all included hardware in pre-labeled bags. +/-5° post-installation adjustment allows perfect TV leveling. Comes with 6 ft HDMI and Torpedo level. Easy tilting adjustment with tool-free spring loaded handle.